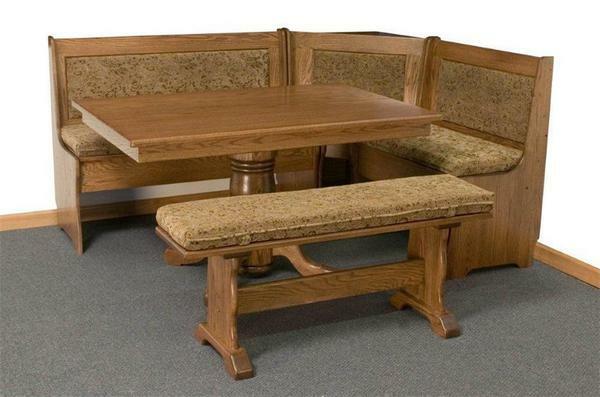 Our Traditional Breakfast Nook Bench Set is sure to make your kitchen or dining room a more welcoming space. Transform your kitchen with our Amish made kitchen furniture. This Traditional Breakfast Nook Set is one of our most popular Amish furniture pieces. Handcrafted with the highest attention to quality in every detail, it is also affordable! Lots of Storage - This solid wood Amish breakfast nook set tucks into the corner of the kitchen and offers 6" of storage inside the storage benches. If you need extra storage space then upgrade to the 16" inside storage space. The lid on the two benches easily lifts and is secure with one soft close lid support. The breakfast nook can be built to fit either a right-facing or left-facing corner. Customization Available - Breakfast is the most important meal of the day so what better way to start the day then seated at a beautiful kitchen nook set. We can customize our Amish breakfast nooks and Amish corner nooks to fit the space in your home, business or the size of your family! Please call for customization requests, or to purchase one part of the nook set individually. Upholstery Option - If you are interested in having this breakfast nook set upholstered then choose from our many fabric and leather options to create a space-saving banquette. The nook set comes standard with solid wood raised panel backs and wood seats which give it a nice traditional look. Fit this nook under a window to create the look of a built in banquette. Order Wood Finish and Upholstery Samples - Choose from Oak Wood, Brown Maple Wood, Cherry Wood, Quarter Sawn White Oak Wood, Hickory Wood or Maple Wood on your breakfast nook set. We also have a wide variety of stain and fabric options to choose from. After an order is place, we are happy to send out finish and fabric options free of charge. Call one of our Amish furniture specialists today for assistance with our kitchen furniture or stop by our store in Sarasota, Florida. As with all of our furniture at DutchCrafters, we stand behind the craftsmanship of this beautifully made Traditional Breakfast Nook Set. We've earned our reputation and our A+ Rating with the Better Business Bureau through years of turning shoppers into very satisfied customers! Shop all of our many styles of breakfast nook sets and corner nook sets with storage. Please note that some easy assembly is required for this breakfast nook set. *Note: If you get fabric backs on the nook set, the bench height is 38"
Please call for custom pricing on different size benches or to purchase individual pieces instead of the entire set. Everyone gives me a compliment about my table. I love this table but most importantly my picky husband loves it as well. It feels cozy and it's such an inspiration for me. I hate cooking but just spreading my meals and feeling like I'm eating in a diner does it for me. It is great. Everything I wanted and more. Thanks so much. You and Dutchcrafters are the best. We ordered from Dutchcrafters because of all the glowing remarks from other happy customers. We will for sure add our happy comments. Here are a couple of photos of our beautiful nook. We seldom take any pictures without our grand daughter in the photo so you get to see her happy face too.